VASCO: Goa Pradesh Congress Committee Vice President Sankalp Amonkar has vowed to take up the issue violation of model code of conduct and is likely to file a complaint with the Election Commission on Monday. Amonkar said the bus stops which were displaying the BJP advertisement is clear cut case of violation and it is negligence on the part of flying squad. The NCP leaders also feel that stringent action is need on the issue. In a recent incident, two bus stops one from Sada and another from Mangor hill junction were seen with the BJP advertisement with the poster of Narendra Modi on it along with party symbol. The advertisement appeals to voters to vote for BJP and promises free medical treatment upto Rs 5 lakh. Since the model code of conduct is in force in Goa, this advertisement has raised many an eyebrow from the Opposition party as well as among some people. When contacted, Amonkar said that he was asked to cover his party symbol, hand and other advertisements displaying the message of vote for Congress in his office premise by flying squad. “Then, how can they allow such a biased treatment by allowing big advertisements on bus stop?” he questioned. He said that flying squad has turned blind eye to this issue in fact they should have acted immediately after noticing this advertisement. Amonkar contented that it is a violation of model code of conduct. “Therefore, I am going to file a complaint with the returning officer of Election Commission to take action on this issue,” he added. NCP leader Jose Philip D’Souza said that, if such violation has happened, then, it is a duty of the Election Commission to take note of it and take immediate action as it must to follow the model code of conduct strictly. When contacted, senior BJP leader Rajendra Arlekar said that he was unaware of any such advertisements displayed on bus stops and has also firmly opined that BJP party workers must not have displayed any of such advertisement. Arlekar denied any involvement of BJP workers in the bus stop advertisement issue and also opined that it is a duty of flying squad to find out who had done such things. 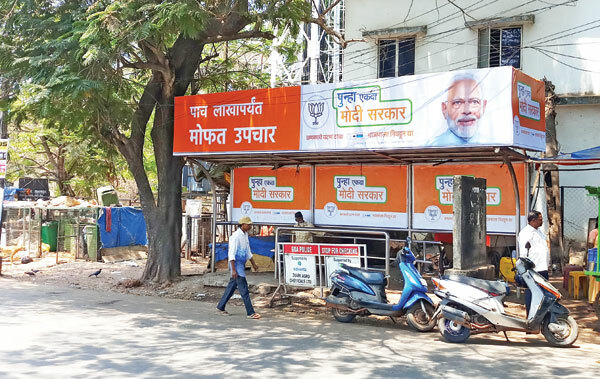 When inquired about this issue with the BJP Yuva Morcha general secretary of Vasco Amey Chopdekar, he completely denied about anyone from BJP block involved in displaying that party hoarding at the Mangor bus stand.